$100 off the first month school fees when you enrol by April 30, 2019. Enjoy 30 % off registration fees until March 31 2019. 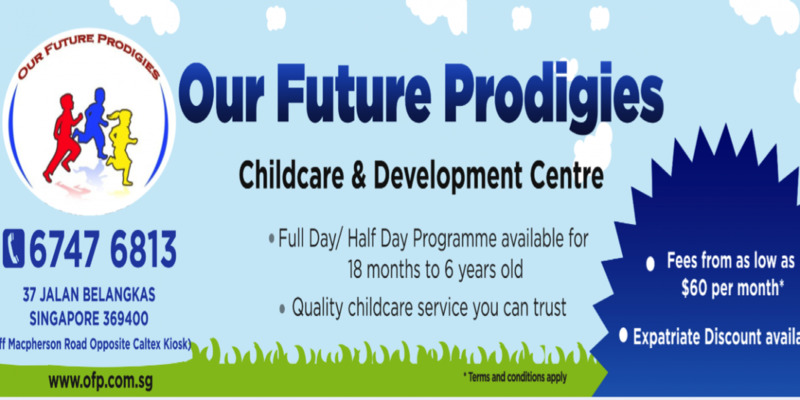 Our Future Prodigies was founded in 2009 and accepts children from ages 18 months old to 6 years, which will be placed in the 5 different age groups. Our Future Prodigies located at Machperson, is nestled in a cluster of private homes, which is 15 minutes away from Aljunied Mrt station , 10 mins away from both Tai Seng and Machperson Mrt station and 3 minutes away from Mattar Mrt station. The neighbourhood provide a natural and safe background for both learning and an active school community life. 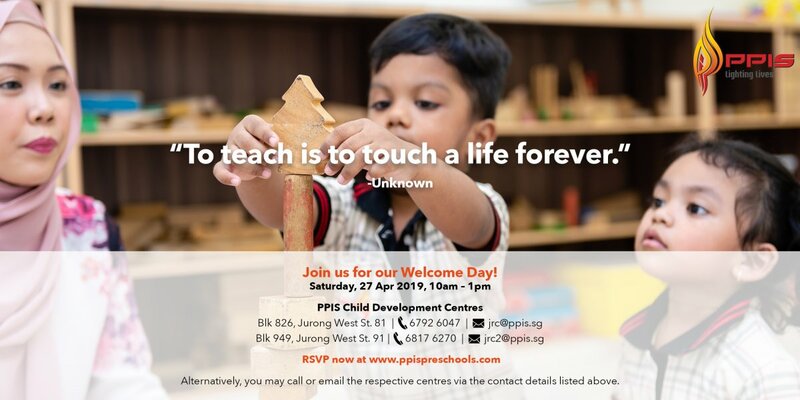 The two storey bungalow school which spans around 4300 square metres is appropriate for 46 students, where activities are carefully balanced with our continued holistic approach to develop minds socially and emotionally, and to empower them for their own learning. The centre is equipped with a hard and soft surface playground, as well as an in house sandpit which exposed the children to the different forms of play. There are 3 classrooms on the first storey, together with the dining area, as well as the kitchen while there are 2 classrooms and 2 activity rooms on the second storey. The supervisor has over 25 years of experience and has specially designed the curriculum which includes English, Chinese, Art & Craft, Music and Movements and Science. There are also enrichment programmes in the form of a reading programme, creative writing, speech and Drama which aid in character building. The curriculum incorporates play in their approach as it is essential for young children’s cognitive, social, emotional, and physical development. Through play, children express, combine, and extend what they know about the world around them, incorporating their knowledge and skills. 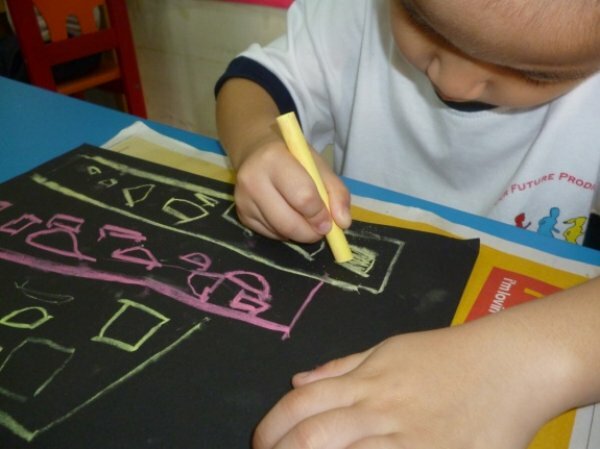 Children regularly participate in various kinds of play, which can be either child-led or teacher-initiated. Our safe and nurturing atmosphere encourages children to build confidence and take risks. We believe that children feel most safe, secure and supported when their sense of shared ownership and belonging is emphasised. Children learn about themselves and the world, and construct their own identity within the context of their families and communities. Connections to home and family are viewed as integral to learning and are a visible part of curriculum planning and the environment. Children work together as a learning group, fostering their individual competencies and making collaborative discoveries. 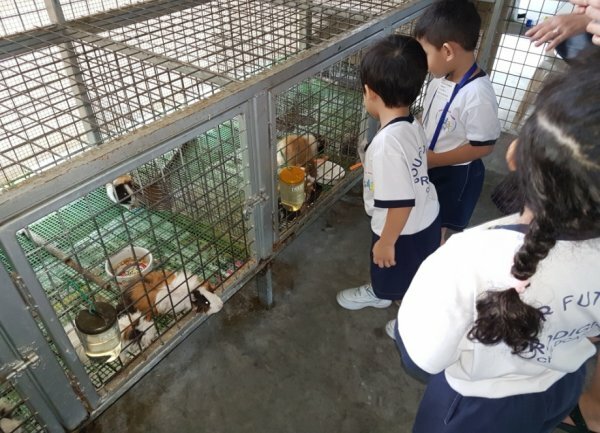 Connecting to Nature: Experiences with the natural world encourage children to use all of their senses to explore and discover. 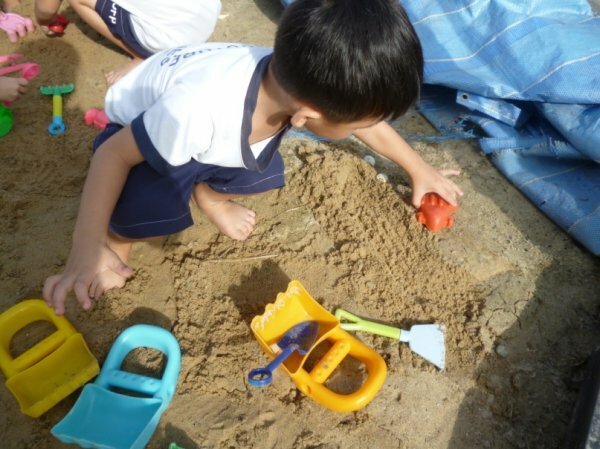 As children work with natural materials, they learn about their role using the physical properties of their world. 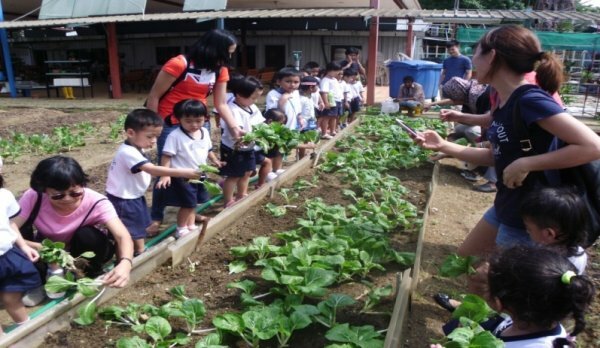 Our programme supports engagement with nature inside and outside of the classroom as well as partnerships with government bodies such as Nparks to bring about horticultural projects. 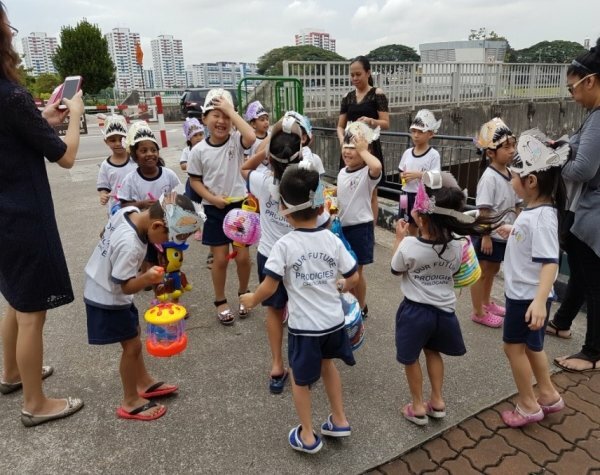 Organisation: Our classroom time remains flexible within a balanced academic programme, while continuing to respond to the emerging needs and interests of students while learning through play. Each month, a new theme is introduced in which the children are introduced to the various facets of life. We show respect for children’s learning by not interrupting their sustained involvement in projects when it is not mandatory for a transition to occur. Physical Space: The physical learning environment is designed to support learning objectives, as well as the needs of young children. 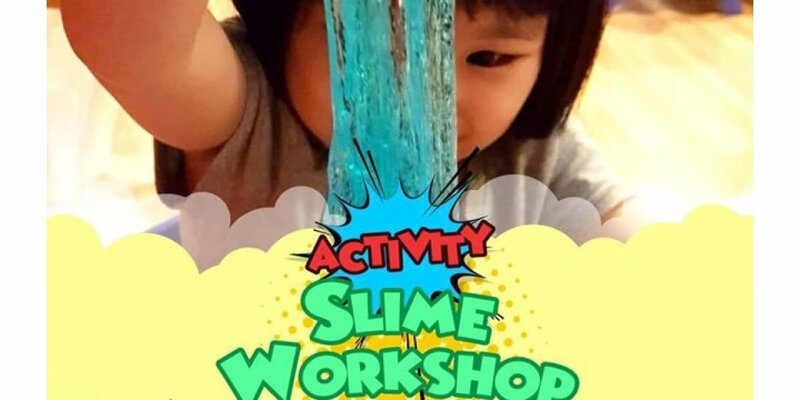 The arrangement of activities as well as off site excursions encourages children to make choices, manipulate, create and represent their ideas and understanding. 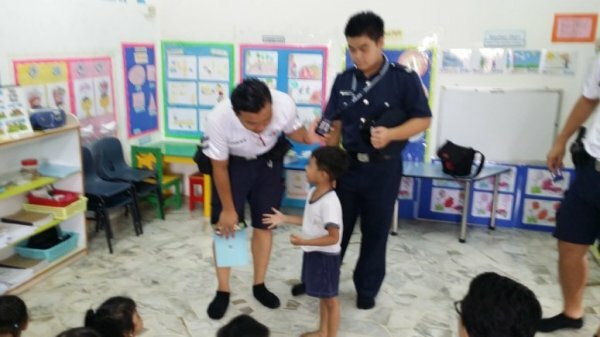 There are various learning corners throughout the centre which serve as a continual reminder of children’s learning and points of engagement to support inquiries. Please call 67476813 or email ourprodigies@yahoo.com to find out more details. At Our Future Prodigies, we believe in providing good, affordable and quality education to nurture children from the ground up. The key to raising future prodigies of our nation is by fostering a good foundation. We believe a good foundation contributes significantly to achieve academic success, personal growth, and allows the children to become socially responsible with an appreciation of learning as a life-long process. 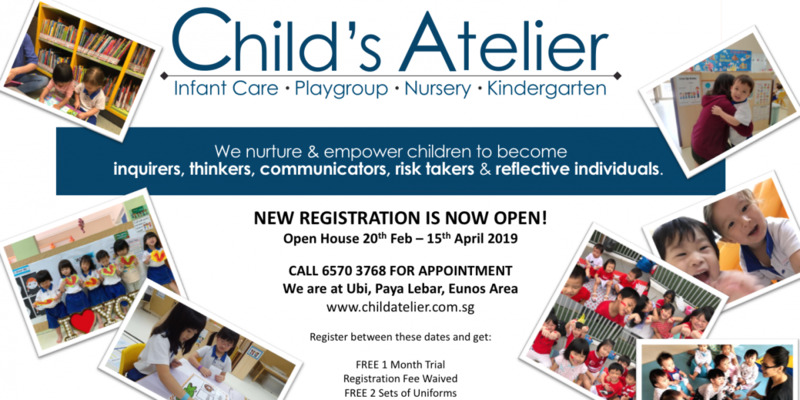 Our activities at the childcare centre are carefully balanced with a continued holistic approach through a range of activities events and community service participation to develop minds socially and emotionally, and to empower them for their own learning.